My Mom was always baking for holidays and signing up to bring a dish to Church picnics and potlucks. That’s probably where I got my love of baking, and passion for feeding people. Mom definitely brought home the idea of food as comfort. One dessert Mom liked to make for Easter was her Four Layer Delight. It is a tasty and light dish that you can make in a number of variations for any occasion. 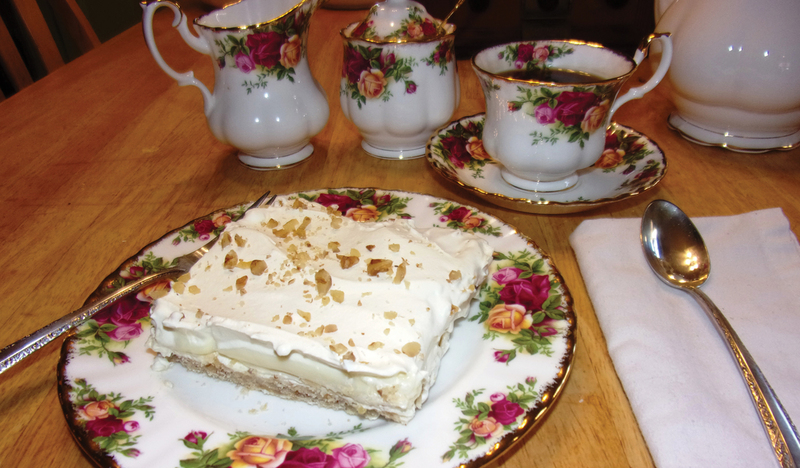 Here is “Mom’s Four Layer Delight”! Enjoy! Mix all above together-Press in a 9x13 pan and bake at 350 degrees for 25 minutes, and cool completely. Spread this over the cooled crust. Spread this over the layer of cream cheese. Top with cool whip, sprinkle with nuts and refrigerate! EAT!